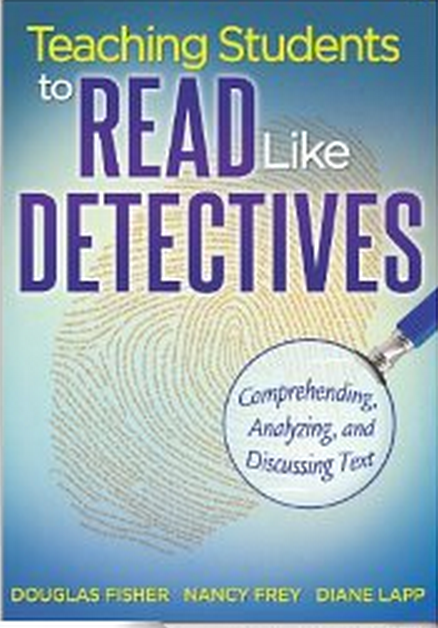 This week's featured book is that authored by Frey and Fisher titled "Teaching Students to Read Like Detectives: Comprehending, Analyzing, and Discussing Text " . This is an excellent read packed with interesting insights to help you raise critically aware readers. The authors provide several examples, rubrics, and instructional materials that teachers can use with their students to transform their reading experience and teach them new skills on how to interact with text in deeper and more interactive ways. Fisher and Frey emphasize the importance of students prior knowledge and personal experiences in shaping one's understanding of the text. Drawing on their prior knowledge, students get to explore multiple reading avenues to compare, contrast, validate and extend the materials they are reading. Throughout the entire book, the authors use the word text holistically to refer to newspapers, photographs, video clips, poems, and many other semiotic forms. Additionally, the authors adopt a stance to reading instruction that integrates Common Core Standards requiring that students go beyond the formal features of a text to consider its sociopolitical and historical context. Meaning, in this sense, does not exclusively reside within the text, but is also represented through a variety of background and contextual elements. Different ways to explore the relationship between text, learner, and learning as students engage in discussion and rhetorical reading and writing in elementary, middle and high school settings. Principles of discussion and discourse that lead to deep learning. Explanation of principles of argumentation and rhetoric. How to use discourse and rhetoric in conjunction with narrative and informational texts with examples of text-based discussions about fiction. How teachers can use the features and structures of informational texts to foster students' thinking. How media influence the ways both narrative and informational texts are located, shared and created.